Norsk Display delivers high quality displays for extreme conditions. Unique weighbridge and process displays with IP65 protection. European design and manufacture combined with free & impressive support makes it a safe buy. 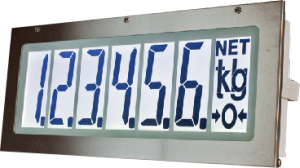 A selection of text and numeric displays, LCD for elegant low power and extended life or LED for a more eye-catching experience. We'll ship to any corner of the world. Some readouts have a low resolution and large display area. In such cases a MINIMUM reading distance should be considered. We advocate a quick glance at the display should suffice to grasp the message. You may judge this differently in your application depending on use. Normally, outdoor installations are exposed to wider temperature ranges, large variations of ambient lighting and uncontrolled moisture levels. For outdoor use, the display must be designed for these challenges to serve you best. Even when indoors, some industries inevitable need to wash down or steam floor/walls and equipment. In such cases you need to have the right protection for your electronics.